York College received a B.
Washington Monthly's ranking of 229 out of 346 of Baccalaureate Colleges - Overall Rank was a major contributor to this grade. 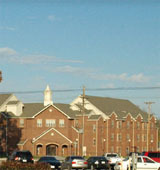 York College is Christian college with 459 students located in York, NE. What are the top 3 reasons someone should attend York College? York college is a small college that allows students to get to know their professors, reduces travel around campus, and makes it easy to make new friends. What is a typical York College student like? Describe the type of person that should attend York College. The typical York College student dresses comfortably, is usually from out of state, and lives in the dorms or on Jackson street. Welcome to the York College community online. Whether you're an alumnus or alumna of the college, a longtime friend or exploring the possibilities for your future, let us help you. Contact my office or others on campus to answer questions and serve you. York is now a four-year college with outstanding academic credentials and a history of preparing men and women to be leaders in every aspect of their lives. While the academic experience has expanded from when I was a student, I am pleased to tell you that the concern and dedication of the YC faculty and staff is still the same. Around here we refer to that as the "York Experience." At York College every person is important. York prepared me academically, which I expected. However, York also prepared me spiritually and socially, which has become more important to me throughout my career. At York I was able to find my future, find lifelong friends (including my wife), find myself and find God. I invite you to consider what York can do for you. This college has prepared thousands of students for the business of life. I encourage you to learn more about how you may join them and find a great preparation for life here at York College. What are the top 3 things that students do for fun at York College? The top three things that students do for fun at York College are Drive-in movies, concerts and fall fest. Campus housing is available for undergraduates. Housing deposit : $100.00. Housing deposit due : Aug 31. Housing deposit is refundable in full if student does not enroll.. Freshman allowed to have car. No pets. 86% of students live on-campus. 55% of female students live in sororities. 24% of students graduated in the top quarter of their class. The average student pays $17,733 for tuition, fees, and other expenses, after grants and scholarships. Total stated tuition is $13,760, in-state and on-campus, before financial aid. York College participates in the NAIA Division II for college athletics. Want more info about York College? Get free advice from education experts and Noodle community members.